Hosting cloud servers can be difficult, especially if your first experiences with it are with complex providers like Amazon AWS and Microsoft Azure. Learning this platforms takes weeks of full time study to use them effectively. While it’s undeniable these two enterprise platforms are incredibly powerful, do you really need such a complex platform to start off on? The answer to that is usually NO. Most people just want a reliable affordable server, dedicated IP, snapshot backups and a easy to use firewall. My personal favourite which meets this criteria is Vultr which we use for testing, development and deployment of non critical workloads. It’s quick and easy to spin up servers, management features are straightforward and you don’t have to be a detective to figure out the billing. Pictures really sum up a thousand words here. This is the main dashboard you are presented with when first signing on. In this demo environment we have 3 servers in 3 different data centres. Their location, status and billed amount for the month is clearly visible. Servers in the dashboard can be sorted by ‘location’, ‘alphabetically’ or grouped by ‘tag’. There isn’t a great deal to the process. By clicking on the instance you get more detailed information about the server such as its hardware specifications and usage statistics. Automatic Snapshot Backups of the server can be taken for an additional cost. Included for free is a basic rule based firewall which sits between the internet and the virtual machines WAN port. Its easy to use and powerful enough for most applications. Firewall rule groups once created an be linked to multiple instances. Currently DDoS protection is not available in the Sydney location. -Instances are charged the full rate, regardless of if they are running or offline. -Storage charged in complete blocks (ie 10GB) not per KB like Amazon S3. While we haven’t experienced any issues we wouldn’t recommend using Vultr in production unless you have your own internal safeguards to mitigate against downtime and data loss. 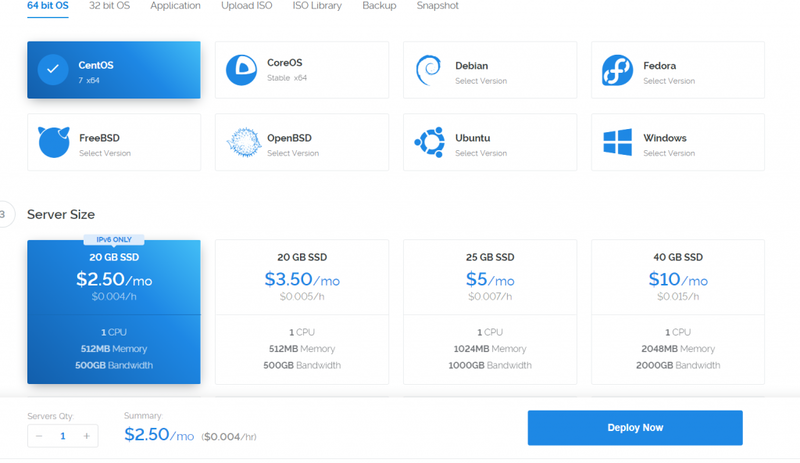 Nor is Vultr a direct rival Amazon or Microsoft with its hundreds of different complementary technologies like network load balancers. For general web hosting we’d recommend against setting up your own linux servers as quite often shared cPanel hosting is faster,cheaper, more stable, more secure and almost always easier to use. If your just looking to spin up a few linux instances, run a game server or setup services like VPN’s it may be perfectly suited and a fraction of the cost of it’s larger competitors.